In 2010, UC Davis established the Smart Lighting Initiative in an effort to reduce campus-wide lighting consumption by at least 60% below 2007 levels. The first phase of the program included a large-scale deployment of over 1,500 network-controlled LED streetlights, area lights, post tops, and wall packs. The lighting installation with controls has reduced annual energy use by an estimated 1,231,758 kWh, saving $120,909 annually in energy and maintenance costs. Although the project team did not specifically measure the additional savings attributable to the lighting controls, project data suggests that these incremental savings contributed an additional 20-40% beyond the savings captured by the LED upgrade alone. 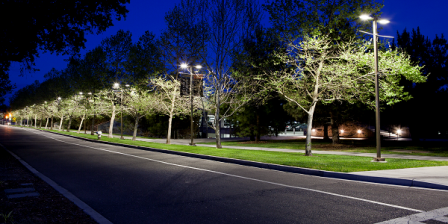 Like many university campuses, UC Davis is illuminated by different types of outdoor lighting fixtures that were installed throughout the development and expansion of the campus. These fixtures use a variety of light sources, including high-pressure sodium (HPS), metal halide (MH), induction, and LED technologies. All are controlled by photosensors or scheduling controls to prevent energy waste during daylight hours, but some lack occupancy, tuning, or scheduling controls that could save energy during nighttime hours of operation. Most campuses have limited bandwidth to research new technologies or scope and execute large-scale lighting projects to achieve greater energy savings. UC Davis Design Construction Management (DCM) contracted with Sacramento electrical design house Peters Engineering to audit the campus’s exterior lighting, develop a baseline measurement of pre-retrofit energy use, scope the size of the retrofit, and design the retrofit. 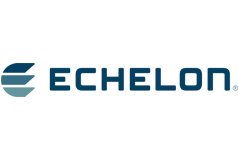 The university selected Echelon to supply the radio frequency (RF) network control system. Other lighting system components including street and area fixtures, wall packs, post top fixtures, and outdoor motion sensors were purchased from other lighting manufacturers. The campus-wide lighting retrofit at UC Davis reduced outdoor lighting energy use by 86% on average, surpassing the 60% goal set by the campus. It also now provides extensive maintenance savings and energy monitoring services. Retrofits addressed 1,347 street and area fixtures, 101 wall packs, and 86 post top fixtures. For street and area lighting across the campus, the standardization to LED technology and the advanced programming features available through the Lumewave by Echelon™ control network reduced lighting energy use by 73%, with approximately 19% due to controls. The new LED wall packs automatically dim during vacant periods, so they operate at just 20% of full lighting power when in standby mode. High-end trimming allows the fixtures to be programmed through the network, so they operate at 80% or 90% of full power output when occupants are detected. The Lumewave by Echelon control system measured energy savings of 89% for the LED wall packs, with approximately 42% of savings due to controls. Data collected through the control network reported energy savings of 87% for the LED post top fixtures, with approximately 20% due to controls.